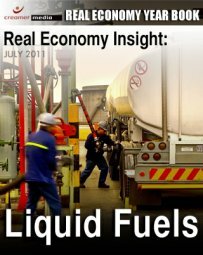 Creamer Media’s Real Economy Insight brief on the liquid fuels sector examines the state of the industry over the past 12 months and delves into issues, such as production and infrastructure, besides others. A full summary of Creamer Media's Real Economy Yearbook – covering the Automotive, Construction, Electricity, Liquid Fuels, Steel, Water, Coal, Gold, and Platinum sectors – is also available from Creamer Media. To purchase a PDF copy of the full contents of the Real Economy Year Book click here.